It is not generally known that the Pug was the most popular of all dogs in England and the Continent many years ago. It is generally accepted that the Pug originated in China and made its way to England through Holland. With the introduction of other toy dogs, the Pug began to lose its popularity in England and there was a danger at one time that the breed would become extinct but more stock was introduced from Holland and Austria in the reign of George III, and this gave the breed a new lease of life. The breed in Australia has been kept going by imports from England at different times. 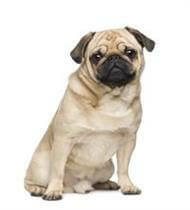 The perfect blend of little dog appeal and wistfulness and big stamina and courage is to be found in the adorable Pug. If you only have a small yard or live in a flat, the Pug is for you. They are remarkably free of ‘doggy’ odours, and their short coat sheds very little, they are also exceptionally clean. Most Pugs tend to laziness if left to their own devices and so a brisk walk or a vigorous game of fetch every day is needed. Do not allow strenuous exercise in hot weather or just after meals. Pugs, being intelligent and tending to independence, are not the easiest dogs to train, but they are trainable and it does them a lot of good to have a purpose in life. A local obedience club will put you on the right track and introduce you to another aspect to owning a dog and it becoming a companion – not just a pet.